The use of organic soaps is not new to me. In fact, I have tried a few kinds already and all have varying effects. One thing I love about organic soaps is that they are made of natural ingredients like papaya, calamansi, milk and many others. Recently, I tried Milea (All Organics) Calamansi Soap because I was attracted with its deodorizing claims. I was on the process of switching to natural underarm deodorant at that time and I was thinking that with the help of this soap, I may skip using any deodorant during less active days and still feel confident that I won’t stink. The Calamansi extract in Milea's Organic Calamansi soap is particularly useful in eliminating strong and harsh odors, especially the distinct smell that accompanies fish that may linger on hands or a cutting board. Milea's Calamansi soap can help wash away dull and dry skin and also help with acne. Packaging and Appeal. Like other organic soaps, this one comes in simple packaging. Instead of a box, organic soaps from Milea are packaged in a cling wrap-type plastic with a band around the soap containing the brand’s logo and other information about the soap. 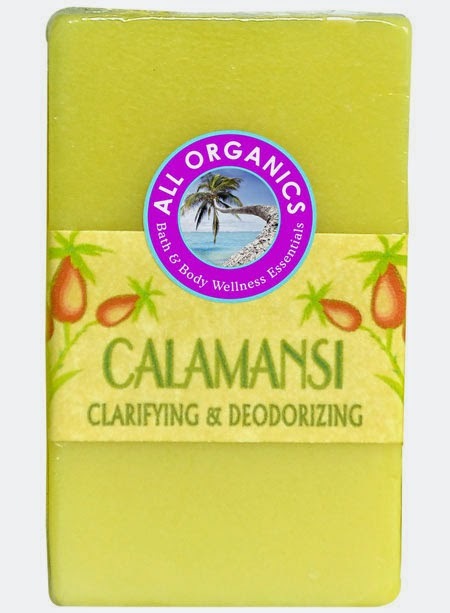 The calamansi soap is light yellow in color. Effectiveness. While calamansi is said to aid in whitening the skin, Milea does not claim that this one has brightening effects. Its main claim is to eliminate strong and harsh odors, wash away dull and dry skin and also help with acne. I will rule out acne as I am not using this as my facial soap so I cannot really tell if this is effective in treating acne. I got this soap because of its odor-controlling properties and I am not disappointed. Even if I only use alum for my underarm after taking a bath (I sometimes skip alum when I am just at home or during less active days), I haven’t gotten that stinking odor. Could be because I don’t really have strong body to begin with but I am quite satisfied that this product is doing what it is supposed to do. Scent. This soap is light-scented, not over-powering and not too fruity either. Price. One bar costs Php 75, a bit expensive compared to non-organic soaps but then it contains natural ingredients which is beneficial to our skin. Additionally, it is made locally so it is also one way of helping small entrepreneurs succeed. Availability. This soap, along with other products from the company, is only available from their official site as well as selected sites such as zalora and eBay.ph. If you need something for odor-control without harsh chemicals, you may want to give Milea Calamansi soap a try. It is effective, safe and pocket-friendly too. One bar can last a long time if kept in a cool, dry place.